The biggest compliment I receive is how ours are the most natural hair extensions our clients have ever had or seen. But what makes our extensions look like natural hair and others so obvious? And why do women for whom money isn’t an issue get fitted with hair extensions that look like hair extensions? I get so mad about this! My kids have banned me from talking about extensions while we’re watching The Real Housewives of Cheshire, MIC, TOWIE, etc! 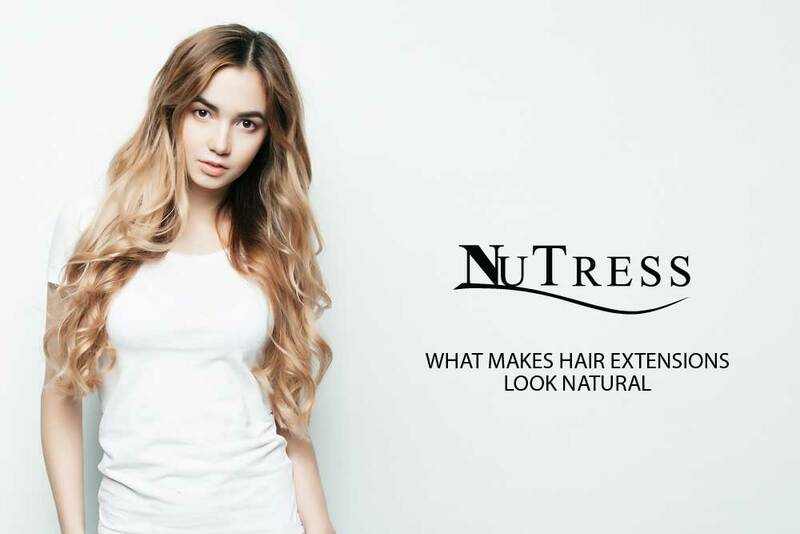 So what makes our hair extensions look natural? A newish client of mine who’s been wearing extensions for 15 years said to me “I don’t know what’s different about your extensions, I just know my hair is the best it’s ever looked”. It was a lovely compliment, but I was surprised that she didn’t understand how our hair extensions were different to what she’d had before. This got me thinking, why would anyone else understand if my own clients didn’t? So, to break it down I’ve compared how our extensions differ from other types. Colour – you need hair extensions that are made from loose hair if you want a good colour match, not pre-bonded, tapes or wefts. Using loose hair means lots of colours, in just the right amounts can be blended together for a perfect match. The colour can be altered during the application to match the area they’re being applied to, and just like your own hair every extension will be made up of different tones. Pre-bonded, tapes and weft hair extensions are bought in specific colours. Your extensionist will choose from a colour ring the colour that best matches yours. It’s unlikely there’ll be a perfect match, so maybe they’ll order a few colours, and a mixture will be applied (this gives a stripy look). You might be lucky and get a good match, you might not, and that’s the problem, it’s down to luck, not design. Hair Ethnicity– natural hair extensions should move and feel like your natural hair, and that’s down to the ethnicity of the hair used. Russian hair is finer than Indian or Chinese hair, so it has more body. Before I came across Russian hair, I used Indian and Chinese hair for years, I thought it looked great. It didn’t, it looked good, but it didn’t look great because it didn’t move. And that makes all the difference, until you’ve seen how genuine Russian hair (there’s lots of fake Russian hair out there) moves, you can’t compare it. Unless budget is your main priority, avoid Chinese hair, it’s heavy and has little body. Layers and cut – hair extensions cannot be cut like your own hair, they look artificial. Natural hair extensions are tapered on the ends just like your own hair. Your hair should look like it’s in a style you chose, and your hair extensions should be part of that style, not a weird addition. This seems obvious, but most hair extensions I see don’t look natural unless the wearers natural hair is already long and fine. Imagine this; take shoulder length hair and put 18″, one length hair under it. Your shoulder length hair is going to sit on top of the extensions. Your extensionist can butcher your own hair to make it blend but that layer is not going to disappear, and as soon as you move, so will the layer. You’ll then have a weird layer sitting on top of the long, one length extensions. You’ll get away with this in a still image or, to an extent, if your hair is curled, but if you want your hair to look natural as you go about your day, you need layers. So, how do we add layers without cutting the extensions? We measure and cut every extension from the root end before we bond and apply it, leaving the precious tip unharmed. The only way to achieve natural hair extensions is with this very specialised and painstaking process. Application -our tailor-made micro bonds and mini locs are made as we apply them. Every hair extension is made exactly how we want it-any length, colour or thickness. This gives us the freedom to apply the most discreet, little hair extensions in area’s that other types of extension can’t be applied in. We can blend away awkward layers, frame your face by adding length and weight around the front and perfectly match highlights. We don’t just add extensions, we extend your hair. If you’re wearing hair extensions now, take a closer look at them. Use a hand mirror to look at your hair from different angles, give it a shake. Have a close look at your colour where your natural hair meets the extensions. What are your tips like? Send us your comments, we’d love to hear from you.